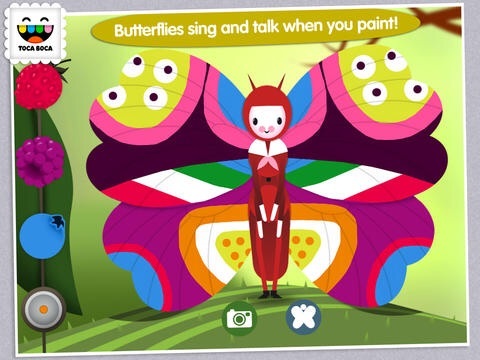 FREE for a limited time – Paint My Wings, a fun coloring app from Toca Boca. Kids paint the wings of three different butterflies. They start by choosing a color and a brush. They can finger paint or “tap” paint to add color and design to the butterfly. As one wing is painted, an identical pattern appears on the other wing – perfect for a lesson on symmetry. The butterflies have quite the personalities. They talk and sing as kids paint them. They name the colors and they giggle when tickled. Finished creations can be photographed and shared with others. Paint My Wings is another creatively fun app from Toca Boca! !